The websites creator or author is ÎÞÎýÎ°Áú. Copyright 2008-2009 - www.chenli.org is the owner of the copyright for this website. 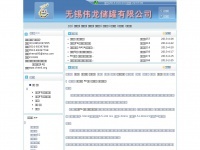 The web server used by Chenli.org is located in Central District, Hong Kong and is run by New World Telephone. This web server runs 1 other websites, their language is mostly chinese. The Chenli.org websites were developed using the programming language ASP.NET and served by a Microsoft-IIS server. Indexing the data of the website and following hyperlinks on it is explicitly allowed by robot information.